TKM College of Engineering is the one and only college in the state of Kerala, to have achieved this top rating of six year accreditation by NBA. Kollam, Kerala: The National Board for Accreditation (NBA), the apex body for evaluation of technical institutions in India, has accredited engineering programmes offered by TKM College of Engineering. The undergraduate programmes offered by the departments of Civil Engineering, Mechanical Engineering, Computer Science and Engineering, Electronics and Communication Engineering and Electrical and Electronics Engineering have been accredited in the recent visit by the NBA team. Out of these, the UG programmes of Civil Engineering and Mechanical Engineering have been awarded the prestigious status of "6 year accreditation". TKM College of Engineering is the one and only college in the state of Kerala, to have achieved this top rating of six year accreditation by NBA, said a statement from the college. 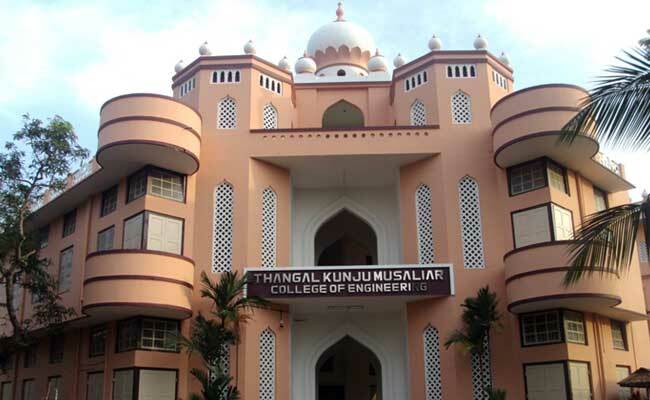 Founded by renowned industrialist and philanthropist late Janab Thangal Kunju Musaliar in 1956, as the first private engineering college in the State of Kerala, TKM College of Engineering had its foundation stone laid by Dr. Rajendraprasad, the first president of India and was inaugurated in 1958 by the then Education Minister Humayun Kabir. The institution went on to become the first Government-aided Engineering College in the state and is managed by the TKM College trust with Shahal Hassan Musaliar as Chairman and TK Jalaluddin Musaliar as Treasurer. The institution began operations in 1958 with an intake of 120 students across 3 branches. However, today with over 3,500 students registered for various programmes, TKM College of Engineering has the highest first year student enrolment for undergraduate courses of any Government or Government aided engineering college in the state. TKM College of Engineering is a much sort after institution with even international student enrolments from Nepal, Bhutan and Nigeria. The institution currently offers Eight Undergraduate and Eight Post Graduate Programmes with Departments of Civil and Mechanical Engineering recognized as research centres by Department of Human Resources Development. The Institution had been honoured with a "AAA" status for National Programme on Technology Enhanced Learning (NPTEL) by Department of Human Resources Development in the previous academic year. In recently released National Institutional Ranking Framework (NIRF) by MHRD for Engineering Institutions, the college has been placed as one among the top 150 engineering colleges in the country. "That this status in NIRF ranking along with the NBA top ranking will provide impetus for the institution to push ahead and aim for excellence in technical education and research in the years to come," said Dr. S Ayoob, Principal TKM College of Engineering on the achievements.